Hello everyone! I am slipping this review in between my 30-day makeup challenge because I want you guys to be able to know and access the products that I will be using throughout the 30 days, and this eyeliner is definitely one of the products I'll be using! The eyeliner I'm reviewing today is the Youngblood Mineral Cosmetics Gel Eyeliner in Black Orchid, which was very kindly sent to me by the PR for Youngblood. 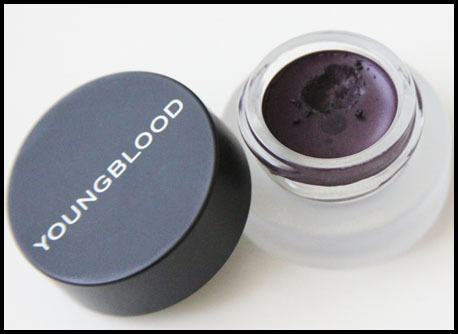 Youngblood Mineral Cosmetics is a non-irritating, quality range of cosmetics developed in 1996. This gel eyeliner is one of their latest offerings, which was launched on the 1st of September 2011. With the finish of a liquid liner and the precision of an eye pencil, these liners are intensely coloured, long-wearing and offer a water resistant, non-irritating formula. Natural ingredients include Lecithin to hydrate the skin, Iron Oxides that provide rich pigment, Methicone for smooth application and Vitamin E to protect the skin. I just happened to have purchased the Bobbi Brown Long Lasting Gel Eyeliner in Violet Ink about 2 weeks prior to receiving this gel eyeliner for review, so I thought it would be perfect if I compared both these gel eyeliners to give you an idea and a sort of feel for both these products. I wanted purple-toned eyeliners because they bring a certain softness to your look as opposed to the harsh black, and purple really brings out the brown in your eyes, which I was desperate to try! As you can see in the picture above, both eyeliners are equally pigmented, which I loved. The picture reflects the true colour - the liners are almost black with a subtle purple tinge - not quite what I had in mind, but definitely convenient when I wanted to wear purple eyeliner to the office! Both eyeliners are also extremely long-lasting - I didn't see any difference with wear time or smudging between both these gel eyeliners. I did, however, find that the Bobbi Brown eyeliner stung a little when I applied it to the very inner corners of my eyes, which also happens to me when I apply liquid eyeliner to that same portion of my eyes. But the stinging is only very slight, and doesn't bother me at all (though when I do liquid liner it bothers me a heck of a lot). 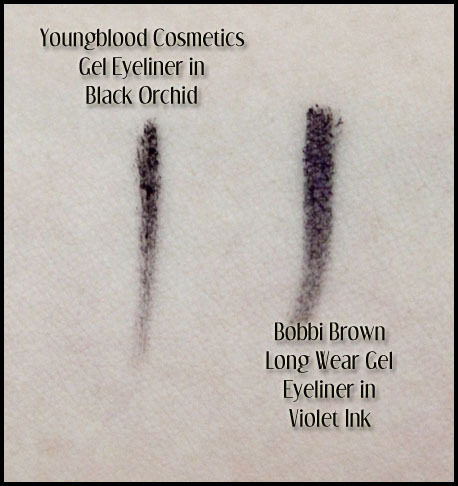 One thing I have to mention about the Youngblood eyeliner is that, as the picture shows, it is a little less creamy compared to the Bobbi Brown eyeliner. The Youngblood also dries out a little faster. I find the problem easily overcome by just warming up the gel on the back of my hand first before applying it to my lashline (I use a pointed, fine liner brush to apply this). I guess this is only a problem if you're pressed for time. Overall, I really like the Youngblood gel eyeliner. It is pigmented and lasts very long on my lids, even when they get oily. These come in 4 other colours - Eclipse (black), Espresso (dark brown), Midnight Sea (deep cobalt blue), and Galaxy (dark grey with silver shimmer). I am dying to try Midnight Sea! If you want to try these gel eyeliners, they retail for AUD 32 per pot. Stockist information can be found on their website.